Religious leaders are urging President Obama and Congress to provide funding for legal assistance to unaccompanied migrant children who are in U.S. custody after fleeing violence, murder and extortion abroad. The emergency funds would go toward helping children who have entered the United States without lawful immigration papers and without a parent or guardian. The money could also help meet mental health needs. Bishop Minerva Carcano of the Los Angeles area is among religious leaders urging emergency funding to help child refugees in the U.S. without their parents. File photo from the General Board of Global Ministries. 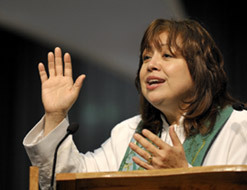 Multiple speakers, including United Methodist Bishop Minerva Carcano and the Rev. David Vasquez, spokesman for the Lutheran Immigration and Refugee Service, took part in a national teleconference Thursday (July 10). They then sent a petition signed by more than 3,800 people to Congress. “We are asking President Obama, Congress and the Department of Homeland Security to do the right thing by providing funding for the care and due process of these migrant children — including the full implementation of the Trafficking Victims Protection Reauthorization Act,” said Carcano. Carcano visited the Oxnard detention facility in California this week and said it was at capacity with 570 children. The children were clean and well-dressed, she said, but there were no funds for mental health care or legal assistance. Rep. Zoe Lofgren, a Democratic congresswoman from California, emphasized that it is time for Congress to respond. -- Copyright 2014 Religion News Service. All rights reserved. No part of this article may be reproduced without written permission.